In larger enterprises, the challenge is to consolidate all the clockings from spread out sites onto a central server so that all time and attendance reporting can be done centrally. 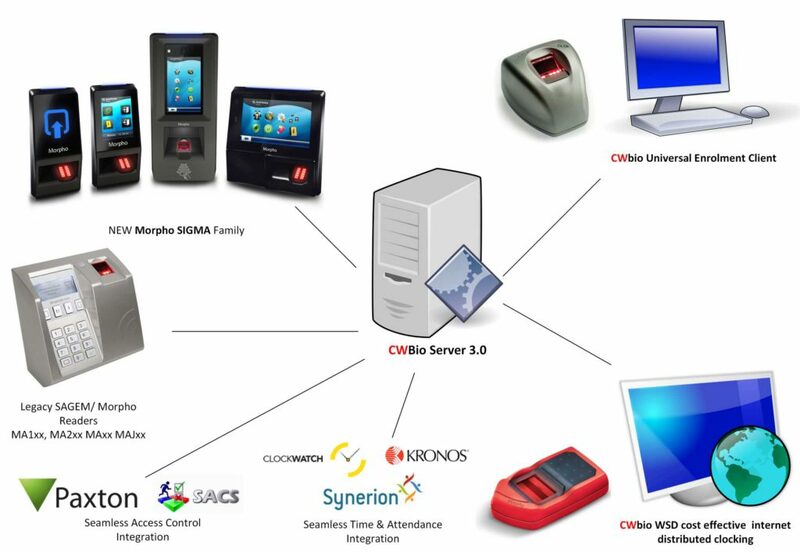 This can be achieved by using intelligent biometric readers at each site, which can link back over the internet to the central server, or to use local computer-based USB fingerprint readers where the local computer is on a WAN and keeps the central server database up to date with every clocking made. • Built on the same robust design philosophy as CWbio 2.4, using the latest .Net framework and supporting the latest Windows operating systems. • Runs on Ms SQL server 2008 and above. • Backwards compatible with all MORPHO/Sagem readers MA1xx, MA2xx, MA5xx MA-J. • Full support for the new family of Morpho Sigma Readers. • Built-in seamless integration with SAFLEC Access Control and PAXTON Access control providing single point of enrolment. infrastructure. This solution is cost effective enough to deploy with few employees. Large companies can benefit for our cost effective distributed system. Each site has a compact fingerprint reader which constantly updates the central server as people scan their fingers. Up to date reporting is available at all times. or complete our contact form here.